As I was thinking of what food to prepare for our dinner last night, I remembered I still had left-over spaghetti noodles. I checked my pantry to see what ingredients I still have. 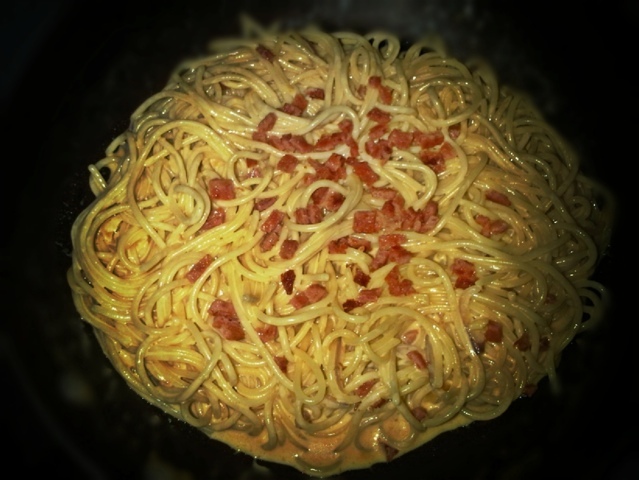 Since my kids are crazy over white sauce, I’ve come up with my own version of a very simple Spaghetti Blanco! Done in less than 10 minutes. Quick and tasty! 1. Heat olive oil and butter in a pan. Saute garlic and onions til onions become translucent. 2. Add evaporated milk and cheez whiz. Bring to a boil. 3. Season with salt and pepper to taste. Set aside. 4. On a separate pan, fry the diced Spam. Drain. 5. Toss the left-over spaghetti noodles into the sauce. Top with cooked diced Spam and drizzle with Parmesan Cheese. 6. You may also serve with garlic bread or a plain toast.